A CENTURY AGO they were the three most popular varieties in the Northeast. Today, Baldwin, Rhode Island Greening, and Northern Spy apples are hard-to-find heirlooms. But a number of orchards still feature them, and they are definitely worth seeking out. 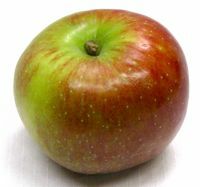 Visit the New England Apple Finder on our New England Apples website to find where they are grown. 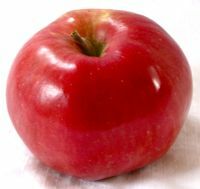 Introduced commercially around 1784, by 1850 Baldwin was the Northeast’s most popular apple. It remained so for more than fifty years. October 15-16 and 22-23: Wachusett Mountain in Princeton, Massachusetts, hosts its 28th annual Applefest, where a number of varieties provided by Red Apple Farm in Phillipston will be available for sampling. Among Applefest’s events is an apple pie contest Saturday, October 15, at 3:30 p.m.
October 22: Senior Writer Russell Steven Powell and Executive Director Bar Lois Weeks of the New England Apple Association will make a presentation about the region’s apples at the White Memorial Conservation Center in Litchfield, Connecticut, at 2 p.m. Refreshments will include apple pie and cider. The video below features Andrea’s methods for making a perfect crust (two other videos on the apple pie videos page of our website take the pie from assembly to baking). Great article – I love heirloom apples and am eager to try the recipe for Apple Pudding! a small correction: while the apple seed for the Northern Spy apple did indeed originate in Salisbury, CT, the apple itself was first grown in East Bloomfield, NY about 1800. Heman Chapin planted the original tree which subsequently died. His brother-in-law, Roswell Humphrey, rescued scionwood from the dying tree and successfully grew the resulting trees to maturity. The apple is first mentioned by name in local periodicals about 1845.For whatever reason, there is quite a bit of misinformation about the origins of the Spy – Martha Stewart made the same mistake and you can read about it here: http://www.mpnnow.com/news/x596326281/Martha-Stewart-and-the-northern-spy?zc_p=1. More information can be found here: http://www.pubhort.org/aps/52/v52_n2_a16.htm. Raised in New Hampshire I have now been a resident of N.E. Wisconsin for 25 years. Needing a little bit of home in my backyard I bought a bare root Baldwin from Miller Nursery in N.Y. about 15 years ago. It has done very well and this year it is loaded with apples. My long dead father would be very happy to see this tree. Thanks for the comment, John. 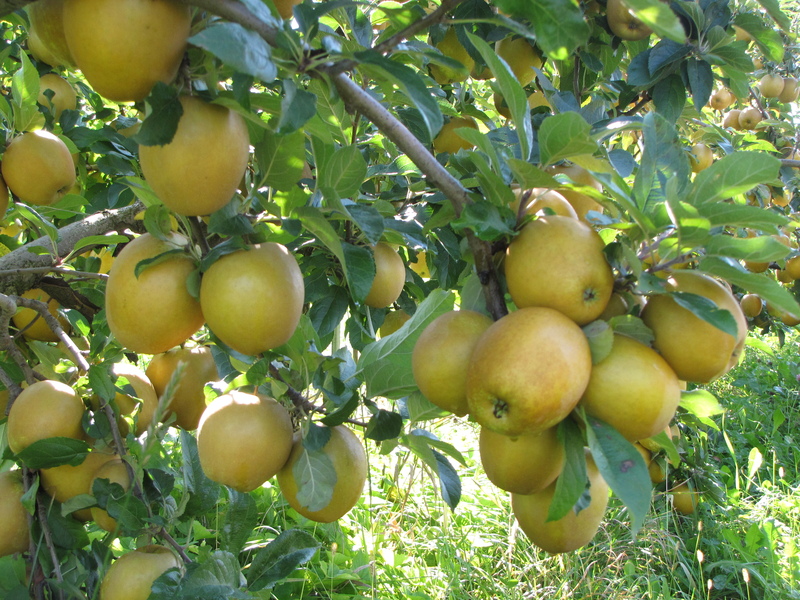 The Baldwin is a great apple–I hope you are enjoying your bumper crop! I came to this site looking for more info on the Rhode Island Greening. I planted one in my orchard here near Grand Rapids about four years ago and this is its first year producing a decent quantity of fruit (maybe one bushel). This apple variety is really something else. In a good year, the flavor of this apple is so wonderfully tart with a hint of lemon flavor. Lots of subtle under-tones. I have heard of its tendency to bear biannually but I have not seen that yet. Otherwise, I am at a loss as to why this is not grown commercially. It seems to have good disease resistance. I’ve had fewer insect problems than with other varieties, other than aphids (but those are easy to control). I will be whipping up a batch of apple crisp tomorrow with some of these and will have a hard time sleeping tonight, just thinking about how great it is going to be. I have a fair number of heirloom apples and other fruit in my 30-tree orchard. I am so glad I planted this RIG. 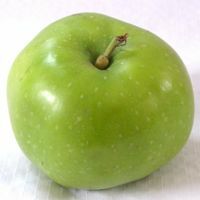 We agree that Rhode Island Greening is a great apple! Glad you are having good luck with it. What are your other heirlooms? A wonderful apple for pies and crisps. Wouldn’t be Thanksgiving or Christmas without a pie made with these. Very hard to find now. The grower told me demand is starting to pick up again.